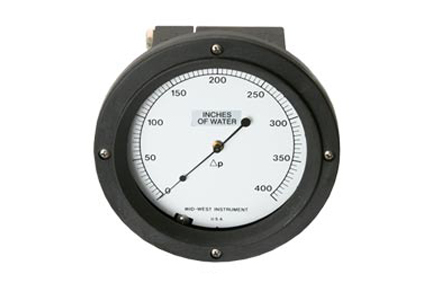 The Mid-West Model 106 is a precision differential pressure gauge capable of working at low differential pressures in high pressure systems. The compact design results in a simple devise that is reduced to essential and necessary elements with a high output motion and rugged construction. The major components of the Model 106 are a two piece body, a multiple diaphragm/bellows sensing element and over-pressure assembly, a torque tube assembly, a range spring and a gauge front assembly. Adjustable from 5 to 95% F.S.